The autumnal equinox occurs tomorrow morning at 5:04AM (9/23/2011 at 9:04 GMT) to astronomically end summer. Thought I would wave goodbye on this last day of summer with a scene I photographed back in July. A young couple gets unexpectedly splashed by waves while watching the sunset from the Lake Ontario shoreline near Oswego, New York. Nikon D700/28-300VR, 1/60s, f/11, ISO 560, EV 0, 300mm focal length. This young couple was watching the sunset from the rocky shore of Lake Ontario near Oswego, New York when a larger than expected wave came ashore causing the girl to embrace her date in laughter. Could this have the makings for a Nicholas Sparks novel about summer love? 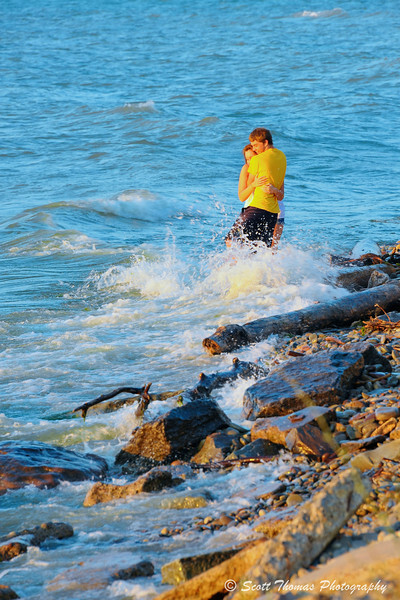 This entry was posted in People and tagged 28-300mm, autumn, boy, couple, embrace, equinox, fall, girl, great lakes, Lake Ontario, laughter, love, man, new york, nikon D700, oswego, rocks, rocky, shore, summer, vr, water, waves, woman, young. Bookmark the permalink. Yep, I was early. Adjusted the text to compensate. Thanks for checking! LOL I only knew because I scheduled a first day of fall post, but double checked anyway (just in case!). Then they also confirmed it on the radio on my way to taking Sara to school. You’ll get a break soon with our pals in central Florida. Goodbye, Summer! Until we meet again… (sob!) Actually, I am looking forward to the festive burst of autumn, almost upon us.